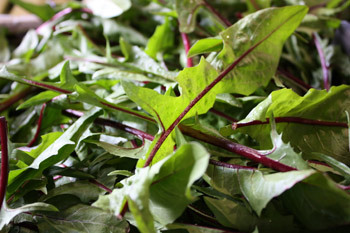 Dandelion greens have a potent flavor that mellows when cooked. They are delicious steamed or braised and can be used in place of spinach. They also make a complex and spicy addition to your favorite grilled cheese sandwich. The name of this vegetable originates from the French phrase “dent de lion,” or lion’s teeth, which refers to the coarsely toothed leaves of the plant. While the leaves are not sharp to touch, they do have a punchy, bitter taste. Dandelions are considered a beneficial weed because they don’t compete for nutrients with the neighboring plants and their taproots are deep enough to bring up nutrients and actually increase soil fertility. Young dandelion leaves are less bitter than mature dandelion leaves and can be used in salads. To prepare, wash the greens in cool water to remove any debris.